The American Revolution began in 1775, as an open conflict between the United Thirteen Colonies and Great Britain. Many factors played a role in the colonists' desires to fight for their freedom. Not only did these issues lead to war, they also shaped the foundation of the United States of America. No single event caused the revolution. It was, instead, a series of events that led to the war. Essentially, it all began as a disagreement over the way Great Britain treated the colonies and the way the colonies felt they should be treated. Americans felt they deserved all the rights of Englishmen. The British, on the other hand, felt that the colonies were created to be used in the way that best suited the Crown and Parliament. This conflict is embodied in one of the rallying cries of the ​American Revolution: No Taxation Without Representation. In order to understand what led to the rebellion, it's important to look at the mindset of the founding fathers. However, it should be noted that only about one-third of the colonists supported the rebellion. One-third of the population supported Great Britain and the other third were neutral. The 18th century was a period known as the Enlightenment. It was a time when thinkers, philosophers, and others began to question the politics of government, the role of the church, and other fundamental and ethical questions of society as a whole. Also known as the Age of Reason, many colonists followed this new train of thought. A number of the revolutionary leaders had studied major writings of the Enlightenment including those of Thomas Hobbes, John Locke, Jean-Jacques Rousseau, and the Baron de Montesquieu. From these, the founders gleaned the concepts of the social contract, limited government, the consent of the governed, and separation of powers. Locke's writings, in particular, struck a chord, questioning the rights of the governed and the overreach of the British government. It spurred the thought of a "republican" ideology that stood up in opposition to those viewed as tyrants. Men such as Benjamin Franklin and John Adams also took into account the teachings of the Puritans and Presbyterians. These beliefs of dissent included the right that all men are created equal and that a king has no divine rights. Together, these innovative ways of thinking led many to believe it their duty to rebel against and disobey laws they viewed as unjust. The geography of the colonies also contributed to the revolution. Their distance from Great Britain almost naturally created an independence that was hard to overcome. Those willing to colonize the new world generally had a strong independent streak with a profound desire for new opportunities and more freedom. The Proclamation of 1763 played its own role. After the French & Indian War, King George III issued the royal decree that prevented further colonization west of the Appalachian Mountains. The intent was to normalize relations with the Native Americans, many of whom fought with the French. A number of settlers had purchased land in the now forbidden area or had received land grants. The crown's proclamation was largely ignored as settlers moved anyway and the "Proclamation Line" eventually moved after much lobbying. Yet, this left another stain on the relationship between the colonies and Britain. The existence of colonial legislatures meant that the colonies were in many ways independent of the crown. The legislatures were allowed to levy taxes, muster troops, and pass laws. Over time, these powers became rights in the eyes of many colonists. The British government had different ideas and attempted to curtail the powers of these newly elected bodies. There were numerous measures designed to ensure the colonial legislatures did not achieve autonomy and many had nothing to do with the larger British Empire. In the minds of colonists, they were a matter of local concern. From these small, rebellious bodies that represented the colonists, the future leaders of the United States were born. Even though the British believed in mercantilism, Prime Minister Robert Walpole espoused a view of "salutary neglect." This system was in place from 1607 through 1763, during which the British were lax on enforcement of external trade relations. He believed this enhanced freedom would stimulate commerce. The French & Indian War led to considerable economic trouble for the British government. Its cost was significant and they were determined to make up for the lack of funds. Naturally, they turned to new taxes on the colonists and increased trade regulations. This did not go over well. New taxes were enforced, including the Sugar Act and the Currency Act, both in 1764. The Sugar Act increased already considerable taxes on molasses and restricted certain export goods to Britain alone. The Currency Act prohibited the printing of money in the colonies, making businesses rely more on the crippled British economy. Feeling underrepresented, overtaxed, and unable to engage in free trade, the colonists turned to the phrase, "No Taxation Without Representation." 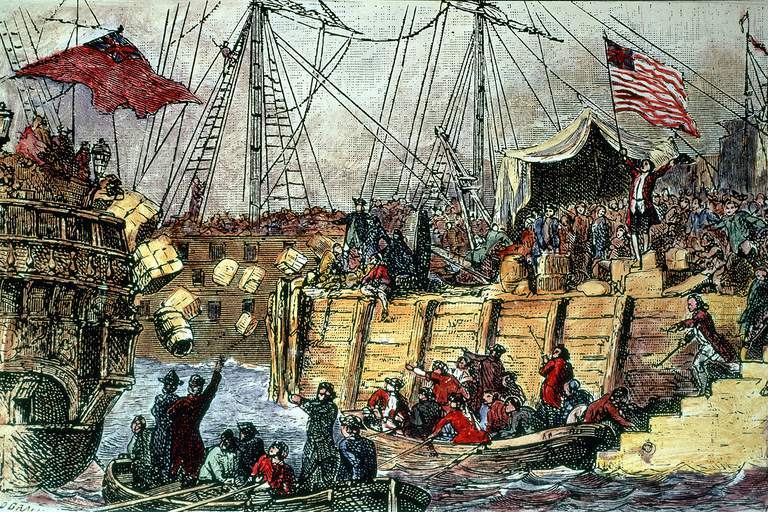 It would become most apparent in 1773 with what would become known as the Boston Tea Party. The British government's presence became increasingly more apparent in the years leading to the revolution. British officials and soldiers were given more control over the colonists and this led to widespread corruption. Among the most glaring of these issues were the "Writs of Assistance." This was tied into the control over trade and gave British soldiers the right to search and seize any property they deemed as smuggled or illegal goods. It allowed them to enter, search, and seize warehouses, private homes, and ships whenever necessary, though many abused the power. In 1761, the Boston lawyer James Otis fought for the constitutional rights of the colonists in this matter but lost. The defeat only inflamed the level of defiance and ultimately led to the Fourth Amendment in the U.S. Constitution. The Third Amendment was also inspired by the overreach of the British government. Forcing colonists to house British soldiers in their homes only infuriated the people more. Not only was it inconvenient and costly, but many also found it a traumatic experience after events like the Boston Massacre in 1770. Trade and commerce were controlled, the British army made its presence known, and the colonial government was limited by a power far across the Atlantic Ocean. If those were not enough to ignite the fires of rebellion, American colonists also had to deal with a crooked justice system. Political protests became a regular occurrence as these realities set in. In 1769, Alexander McDougall was imprisoned for libel when his work "To the Betrayed Inhabitants of the City and Colony of New York" was published. That and the Boston Massacre were just two infamous examples in which measures were taken to crack down on protesters. After six British soldiers were acquitted and two dishonorably discharged for the Boston Massacre—ironically defended by John Adams—the British government changed the rules. From then on, officers accused of any offense in the colonies would be sent to England for trial. This meant that fewer witnesses would be on hand to give their accounts of events and it led to even fewer convictions. To make matters even worse, jury trials were replaced with verdicts and punishments handed down directly by colonial judges. Over time, the colonial authorities lost power over this as well because the judges were known to be chosen, paid, and supervised by the British government. The right to a fair trial by a jury of their peers was no longer possible for many colonists. All of these grievances that colonists had with the British government led to the events of the American Revolution. As you may have noticed, many also directly affected what the founding fathers wrote into the U.S. Constitution. Their words were carefully chosen and the issues highlighted in hopes that the new American government would not subject their citizens to the same loss of freedoms as they had experienced.